the time is not right on this trail cam. apparently a common problem with the primos bullet proof. however the date is correct. Can't see anything in 3. The third image seems to show something very close to the camera itself - could that be an extreme close-up of some hair or feathers on the left of the image? It looks as if something was investigating the camera when the photo was taken. It's impossible for me to tell what it is. I agree with AustralopithecineOz about the other two. I have had moths and night birds on my trail cams which leave a glowing flash on the picture. They are quite surprising at first. Most images which leave lines like that were a moving thing. Good going missm4mi. had a barley bucket with a chicken inside and bread. it was suspended by rope and stainless steel zippy-ties2 metre's above the ground. the whole lot was gone - rope, bucket, everything!!! ... and as usual trail cam shows up nothing!!! not the first time this has happened. I am impressed with you diligence. I have had game cameras out for years and have never baited the target area. I might try it. Could you use cables and padlocks to minimise possible human interaction? Also, details of bait used may cause undue concern in some types of readers. Lol. I think if I try similar I will call it a "tasty bait"
What about a second trail camera watching from a different angle and different distance from bait? damn auto-correct. it was meant to say burley as in a fishing burley bucket. roast chicken leftovers and day old bread was used. and those burley buckets are super tough and so are the steel zip ties. and thick rope. ALL GONE. only have one camera at present not buying anymore anytime soon. going back to retrieve the SD card felt a bit eerie so we ended up bringing the camera back also. I think putting food out could prove to be quite dangerous and risky in attracting a predator that I probably don't want to encounter. on one occasion a year or so ago when walking I was stalked and chased by a small pack of wild dogs - two pit bulls and an alsatian. I have never been so terrified. with not to many suitable options to save myself I ran as fast as I could towards a small gumtree close to another gum and wedged myself between the two and climbed as high as I could. the dogs snarled and barked and circled under the tree. I was so scared I couldn't even breathe properly. after a while they lost interest and ran off. I stayed in that tree for another good half hour before climbing down. council did put some baits out shortly after that and I haven't seen any wild dogs for a while. That is a genuinely terrifying experience. Glad you're okay. I think you're right about not leaving food. You never know what it'll attract. 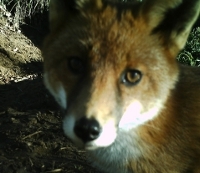 Hi, just wanted to show you one of my bushcam pics, the pic got sent to my phone at work. Iv only used the cams at night mostly so wanted to know if they can be SET OF with the sun rays coming through the trees and also the orange circle and purple thing at the bottom, are these just reflections from the sun making things colourful? ... and also the orange circle and purple thing at the bottom, are these just reflections from the sun making things colourful? Yep just sun glare off the lens. Never run from predators. It triggers them into chasing you and instantly turns you into prey rather than a threat. Make yourself big by raising your arms and shout at them, especially dogs. I am a small person. 3 buff and tough wild dogs of those breeds on 1 - I don't like my chances of standing there and yelling. thinking - first, OK there's a few dogs close by then realising that I was their target - think quick, think quick, get out of there - survive. at that same time I was talking to the grader driver who works upkeeping the firetrails in the local region. he also had a run in with a pack of 10 dogs late one afternoon as he was finishing up for the day. he said his only option was to climb back into the grader and drive it to where he had his car parked instead of walking to his car. anyways back on topic - when "that" picture should be on the trailcam and IT'S NOT THERE! - even with obvious evidence that something was there - it's very puzzling!!! pilliga pigger on YouTube pretty much sums up my reaction when I hear weird noises in the forest. .. I hear this - then I do this. exactly the same reaction everytime. more weirdness - closer to home & no bait used. Where have I seen that particular type of flower before ? I watched this video too. The comment section is also very interesting to read thru. put the trailcam down and slowly back away from the trailcam. good spotting al pitman. I know what that last picture is. not a flower but a plant - I had my trail-camera switched on without realizing as I was walking around to find the next spot to set it up. . The result of a mis spent youth !! maybe it could morph into a yowie, I mean bush turkey.